Willie (Thomas Haden Church) is a goodhearted man living rough on the dangerous streets of Los Angeles’ Skid Row and finds himself coerced by two rich teenagers into fighting other homeless men for cash. Stuck in a violent world he doesn’t fully understand, Willie finds solace when he discovers the discarded diary of a troubled young girl and befriends a homeless veteran, Pinky (Boyd Holbrook). 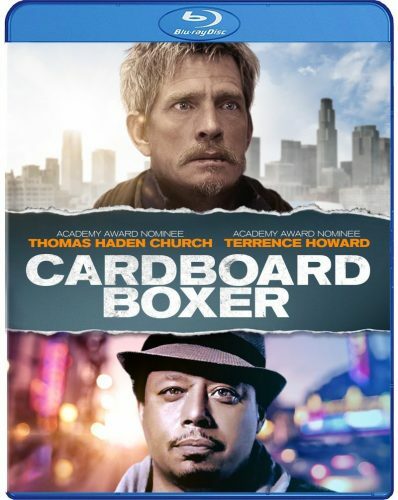 A cab driver named Pope (Terrence Howard) lends Willie a blanket, looks after his friends on the street, and is protective of this little world normally condemned to invisibility. Academy Award nominees Thomas Haden Church and Terrence Howard join GONE GIRL actor Boyd Holbrook in Knate Lee’s (BAD GRANDPA, JACKASS 3D) directorial debut, a powerful tale of loss, redemption, and friendship. The Sound Quality is great with clear dialog decent low-end but nothing boomy like a gun shot as its mostly dialog. The Picture Quality is great. Clean, clear and sharp in the gritty backdrop. Colors are popping and skin tones look great. Cardboard Boxer is a Drama with a Hint of Action. Are lead Thomas Haden Church playing Willie is a man with no home who lives on 5th street aka the nickel. Willie is alone but one day finds a Diary in the dumpster covered in burned belongings. The Dairy written by a troubled young girl who is going through a bad time in life which Willie can semi relate too. He reads it every night while also writing back even though his words will never reach her but its his Wilson moment to get through life as he considers this girl his friend trough her diary.. On another side of the story Willie is recruited by a bunch rich kids looking to him for fighting other Homeless folk for money which is how he got the name Cardboard Boxer. The story is a hard drama that might make some shed a tear or two. Yes we do get a hint of action but that’s like 5 minutes of the movie. The story follows a homeless man while we do see how he lives and all those around him live but the film does not go into a class divide story. Its simply the way of Willies life, and some of his struggles. Terrence Howard is sort of co lead but not a major part of the film. He is like the watcher a helper for the poor called Pope. A Taxi driver who keeps the nickel safe. The whole Child’s Diary portion of the film is what will put the tear in the eye, and will so at the end of the film thanks to Willies memory of the Dairy while reciting the first page in a burn unit. Willie burnt his hands trying to save the Diary. Action wise the film is OK, nothing great just 2 to 3 street fights and not with skill involved which is realistic. Acting wise its great. Overall I Highly enjoyed the film as we follow willies life and how he connects to a child he has never met through a diary and at times using his begging money on books and flash cards so he can learn how to read cursive hand writing. The film does have some character build up but i wish we had more.. We never know why Willie is homeless. The film depicts homeless life pretty good showcasing the mental illness, heart, and community. With that said I give Cardboard Boxer a 4.5 out of 5. More Character building and more build up to some of the more teary moments so they have more of an impact. I say give this a pick up, it’s a great film. Don’t go in thinking its bum fights and action film because it’s not. It’s a Drama all the way through.